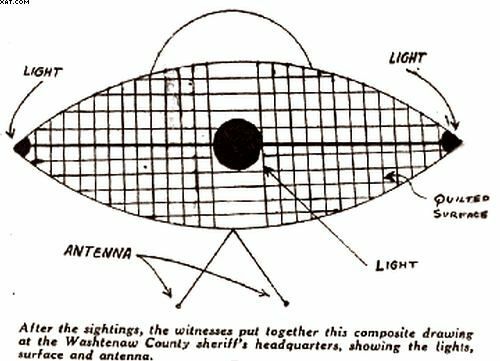 In March of 1966 there was a sighting of UFO's that were spotted by Sheriff's Deputies. They are known to be pretty reliable witnesses. But as I was just 10 years old and living in Ft Leonard Wood MO instead of my home town of Ypsilanti, I missed this story back then. My friend Joe told me all about it and another of my good friends is retired from the Sheriff's Department. Joe believes it and Mike remembers it making the Sheriff's Department, State Police and local community the "laughing stock" of the midwest. 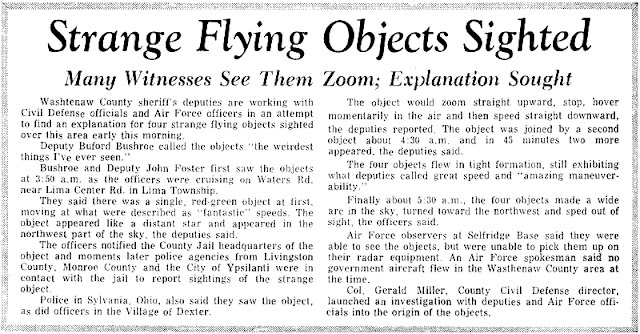 This March 14, 1966 article from the Ann Arbor news described the area's initial UFO sighting. Stateside's conversation with UFO enthusiast Harry Willnus. 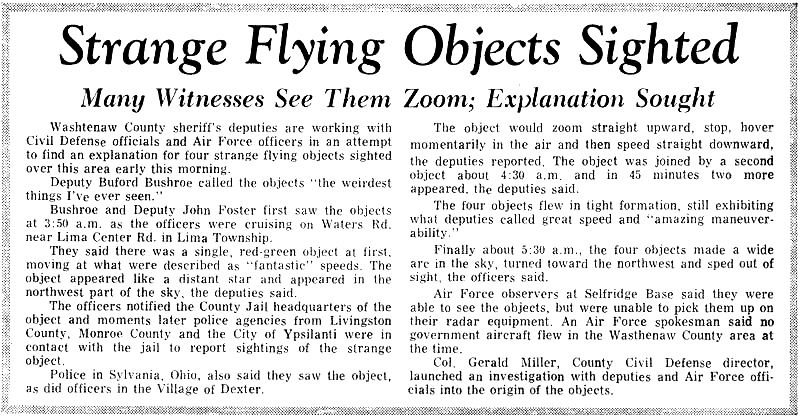 It began in March, 1966 , with a sighting over a farm in Dexter. The official explanation — flares caused by the burning of gases bubbling up from the area’s swamps — was unsatisfactory to many of those involved. Then-congressman Gerald Ford called for a congressional investigation. It never happened. 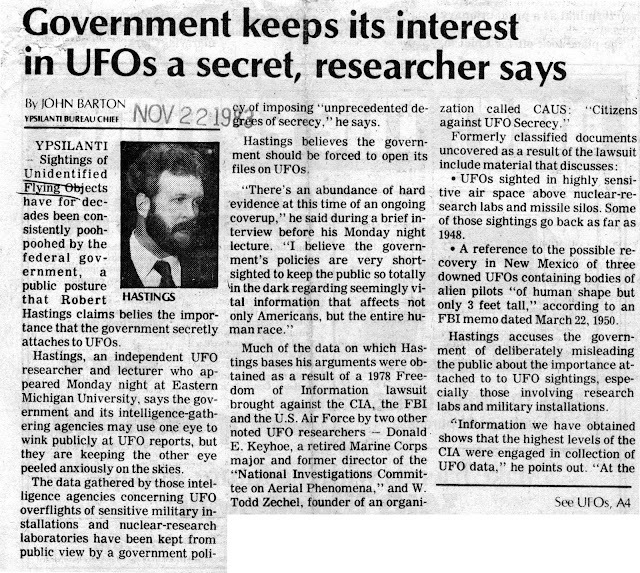 It wasn’t long before UFO mania had swept the nation. 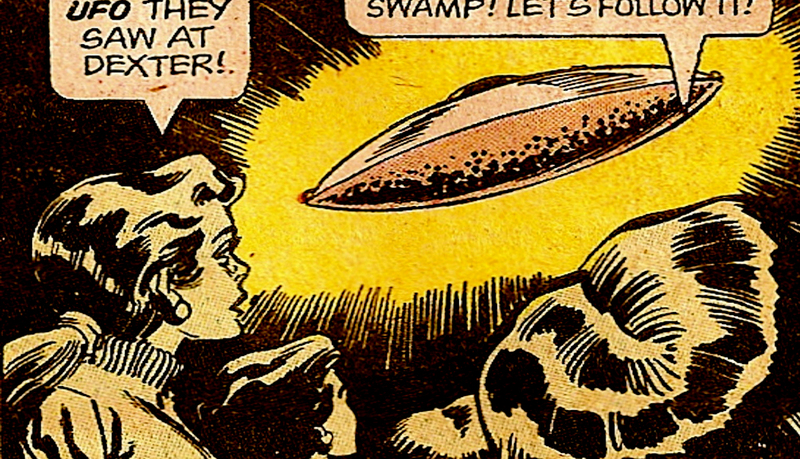 UFO reports were pouring in from all over the country. This was the era that sparked Hollywood’s love-affair with aliens, leading to blockbusters like E.T. the Extra Terrestrial and Close Encounters of the Third Kind. Walter Cronkite anchored a 1966 CBS report titled, “UFO: Friend, Foe or Fantasy?” which featured the Dexter incident. But after the UFO fever subsided, after the Hollywood productions made their millions, after NASA's moon program closed for good—in short, after America moved on — the question remained: what really happened in Dexter that March? Harry Willnus was a teacher in the area at the time. He has been searching for an answer to that question for the last 51 years. During the course of that half-century, Willnus has spoken with many of the most important humans involved in the incident. Nothing he's heard or seen has convinced him that the official version of events is the correct one. Willnus described a particularly strange series of events involving Allen Hynek, the scientist brought in by the Air Force to investigate the incident. One afternoon not long after the sightings, Hynek spent several hours looking for evidence in the Dexter swamp. He was accompanied by Washtenaw County Sheriff Douglas Harvey, who led the local response to the sightings. Afterwards, on the drive back from the swamp, Hynek told the sheriff he still did not have an explanation for the sightings. 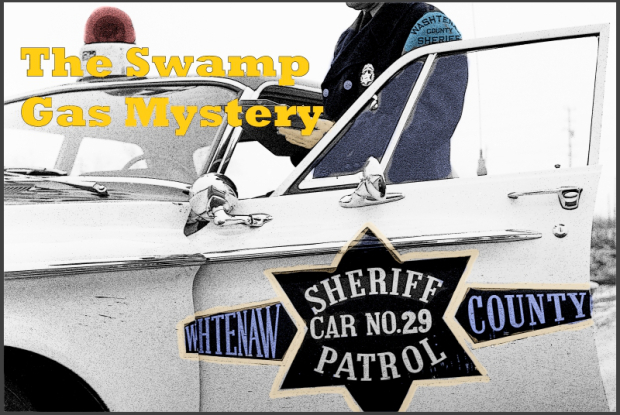 But later, back at the sheriff's office, Hynek received a phone call from Washington, D.C. Listen to our full interview with Harry Willnus above, in which he recounts a UFO sighting of his own.